It has been suggested that Exposome be merged into this article. (Discuss) Proposed since October 2018. An environmental factor, ecological factor or eco factor is any factor, abiotic or , that influences living organisms. Abiotic factors include ambient temperature, amount of sunlight, and pH of the water soil in which an organism lives. Biotic factors would include the availability of food organisms and the presence of conspecifics, competitors, predators, and parasites. Cancer is mainly the result of environmental factors. An organism's genotype (e.g., in the zygote) translated into the adult phenotype through development during an organism's ontogeny, and subject to influences by many environmental effects. In this context, a phenotype (or phenotypic trait) can be viewed as any definable and measurable characteristic of an organism, such as its body mass or skin color. Apart from the true monogenic genetic disorders, environmental factors may determine the development of disease in those genetically predisposed to a particular condition. Stress, physical and mental abuse, diet, exposure to toxins, pathogens, radiation and chemicals found in almost all[quantify] personal-care products and household cleaners are common environmental factors that determine a large segment of non-hereditary disease. 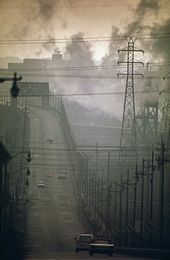 Cancer is often related to environmental factors. Maintaining a healthy weight, eating a healthy diet, minimizing alcohol and eliminating smoking reduces the risk of developing the disease, according to researchers. Environmental triggers for asthma and autism have been studied too. ^ Gilpin, A. 1996. Dictionary of Environment and Sustainable Development. John Wiley and Sons. 247 p.
^ a b c Gallagher, James (17 December 2015). "Cancer is not just 'bad luck' but down to environment, study suggests". BBC. Retrieved 17 December 2015.